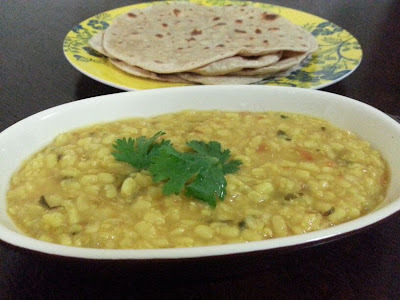 Daal Maash or Maash ki daal has been my favorite since childhood. I would demand my mother to make maash ki daal with roti. It is another very simple yet tasty recipe. It is an excellent accompaniment to any type of indian bread. It tastes good with Dosas too. This is my mother's recipe. 1. Wash the daal a few times and soak it in enough water for at least 30 minutes. 2. In a pressure cooker heat ghee or oil. 3. Add the onions and green chilli and fry till onion turns translucent. 4. Add the urad daal without any of the soaked water. 5. Fry for a few minutes by stirring. If the daal sticks to the base then add a little water. 6. Add the tomatoes, turmeric powder and salt. 7. Add coriander leaves and finally add water. Water should be well above the daal. 8. When it comes to a boil, put the lid on the pressure cooker and let it cook on medium flame for about 10 whistles. 9. Then cook for another 10 minutes on low flame. 10. Turn off the stove and let the pressure release on its own. 11. Adjust the consistency of the daal as desired with some water.